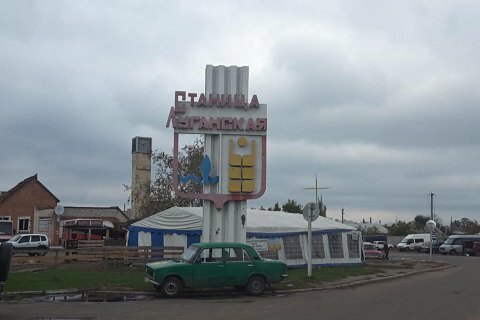 In the evening of 6 April, Donbas militants violated the ceasefire in the area of Stanytsya Luhanska thus disrupting the disengagement of weapons in this area, the ATO headquarters said in a statement on 7 April. The Trilateral Contact Group on the peaceful settlement of the situation in Donbas at a 29 March meeting in Minsk agreed on a ceasefire in Donbas from April 1, and the disengagement of forces at Stanytsya Luhanska from 6 April. One of the conditions for the disengagement was the compliance with the seven days of ceasefire regime in the area. As 6 April, the ceasefire has been observed for four days, and the ATO headquarters held a coordination meeting on the disengagement of weapons and manpower in the area starting 9 April. "However, on 6 April, between 20.05 and 20.40 Kyiv time, the illegal armed formations based in a settlement on Prince Ihor's Hill, shelled Stanytsya Luhanska with heavy machine guns, automatic grenade launchers and small arms. This fact testifies to the deliberate and insidious disruption by militants of the disengagement of forces and weapons in the area," ATO HQ said. ATO HQ stressed that the Ukrainian side firmly adheres to the implementation of all aspects of the Minsk Agreements, including the Framework Decision of the Tripartite Contact Group on the Disengagement of Forces and Weapons signed on 21 September, 2016, and strictly fulfils all its obligations. The Contact Group at a 21 September, 2016 meeting in Minsk signed a framework agreement on the pull-out of forces and weapons in three pilot areas in Donbas. By now, the forces have been disengaged in the areas of Petrivske and Zolote, while the disengagement in Stanytsya Luhanska has been broken several times.